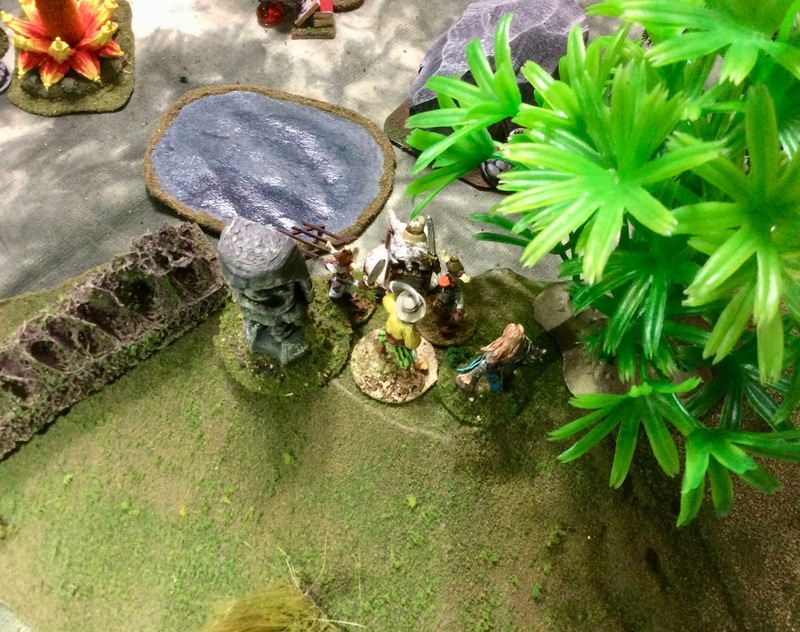 Ghost Archipelago Campaign ’18, Game 6: The Blood Totems | H.A.W.K.S. Chris Palmer This past weekend we got together for the sixth game in our Ghost Archipelago campaign. We had 7 of our regular 8 players. We continued to work on the scenarios in the rulebook, moving on to the fourth one: The Blood Totems. 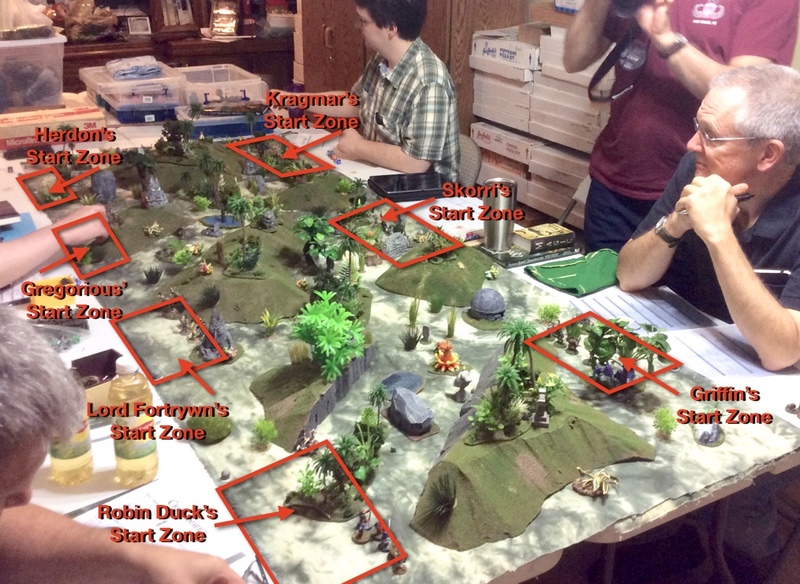 We used an 8’x3’ table, with three players on one side, and four on the other. 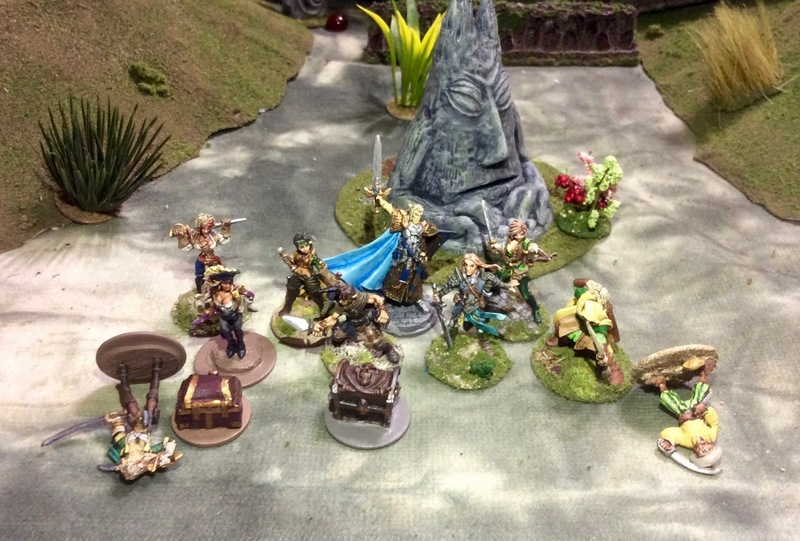 As per the scenario instructions, the 3 central treasures were replaced with Blood Totems, as were all the treasures placed by the players at the start of the game. I was relatively lucky in drawing for starting position, getting third choice; and selected a spot with three of the Blood Totems in apparent easy reach. Unfortunately, Skorri Drakenburg and his Beast Warden, Agger, once again set up across from me and a little to the left. I didn’t look forward to the possibility of a repeat of last month’s debacle. Kragmar of the True Blood, and his Storm Warden, Samael Gale also set up across and further to my left, further down from Skorri. The Heritor Gregorious and his Storm Warden, Missy, were directly on my left on my side of the table, and the strange Duckman Heritor, Robin Duck, and his Duckman Vine Warden, Friar Duck, were directly on my right. Across to my right front were the Heritor Griffin and his Wave Warden, Ashalla. And far down on the opposite side of Gregorious was the Heritor Herndon, and his Warden Arwhine. A look at the table at the start of the game. The Elven Heritor, Lord Fortrywn, was up early and was already on the deck of the Silver Sword when the watch in the crow’s nest called “Land to Starboard!" He had risen feeling better than he had in weeks, and some would say he was in a good mood; though few on the ship could remember ever having seen him in such a disposition and weren’t sure it was possible. The island they headed towards was missing from most charts of the Archipelago, and the few explorers that knew of it’s presence dared to go there; as it had a bad reputation for evil spirits and black magic. Once the home to a blood thirsty tribe who reveled in arcane worship and blood sacrifice, it’s mysteries were many and the legends about it exaggerated. But one thing the Elven Heritor knew for sure; besides their lust for blood, the tribe had also lusted for treasure. And it was said that many a valuable trinket had been striped from the unfortunate early explores, or more to the point: victims, who stumbled on the island, and the treasures were still hidden within it’s misty hills. In a short time, they had landed on the shore of the island, and gazed at the wall of green jungle and the rising green hills behind. The air was unnaturally still and fetid. Lord Fortrywn ignored the somber atmosphere, and ordered the crew to press on. They found themselves passing over series of ridges; low hills at first than longer higher ridges as they went. Once they got further inland, the Elf Heritor began to sense that they were not alone; a small alarm in the back of his brain was telling him that other crews were there on the island as well. So, he stopped and set the commands for his group. Lord Fortrywn divided his crew into three groups. With himself he took the new Hunter, Bindidell Gladeshadow; and the dependable Crew-woman, Arbyn; as well as the Crew-woman, Meriwyn. He assigned to his Niece, Marny, who was also his Vine Warden; the new Archer, Tannin Softsing; the Crewman, Orinde; and Crew-woman, Bry. Crewmen Finil and Sifinly were left to fill in where needed. The one thing the Elf Lord stressed as he gave his orders, was for everyone to stay close and be cautious. If he had learned anything these past months in the Archipelago, it was that letting everyone wander off in their own direction, ending up badly. They were stronger as a group, and he hoped to keep it that way. Lord Fortrywn’s starting set up. As the group moved cautiously up a valley between two low ridges, they came upon a large, primitively carved, stone statue of a giant horned head; with a scowling expression and its arms folded in front of it. They looked it over, but did not notice anything remarkable about it. Then a little further away, on a hill to the left, Bindedell, the Hunter, spotted another, smaller, stone head along side of a patch of jungle on the hilltop. Shortly after, another small stone head was seen next to a patch of jungle running down the center of the valley a little further away; followed by a third such head located on the ridge to the right. They all formed a rough semi-circle around the large stone head. Lord Fortrywn puzzled at the meaning of it all; and having no answers, turned to his niece and said, "Girl, do you make anything of this?" Marnilyne looked back wide-eyed, and shook her head. In all her magical studies she had never come across anything similar. But, she had ever been exposed to anything even remotely like Dark Magic in her training. Without warning, Bindidell took off and jogged up the hill to the left to inspect the smaller stone head. Lord Fortrywn was coming to discover the young Elf had an annoying impetuous side. How he wished Gwynwater, his former Hunter, always dependable, had not been taken from him. The big Heritor started to command, "Come ba…" But it was too late; the Hunter was already halfway up the hill. He cursed, silently in his head, and followed the young woman. Motioning to Arbyn (She was surely dependable, he thought.) and Meriwyn to come with him; the trio followed the Hunter up the hill towards the small totem. Lord Fortrywn still wasn’t sure about this Hunter. Bindidell seemed skilled enough, but her past was a bit of a mystery; orphaned at an early age, and raised in a Human-owned tavern, the young Elf girl had learned to drink and curse like a Human tavern patron. Leaving there as soon as she was of age, she spent the intervening years alone in the woods and forests, learning her trade though hard experience. He still wasn’t sure how she ended up on the dock in Corlair; a far way form the forests of the Borderkeep; and she didn’t seem inclined to want to discuss it. 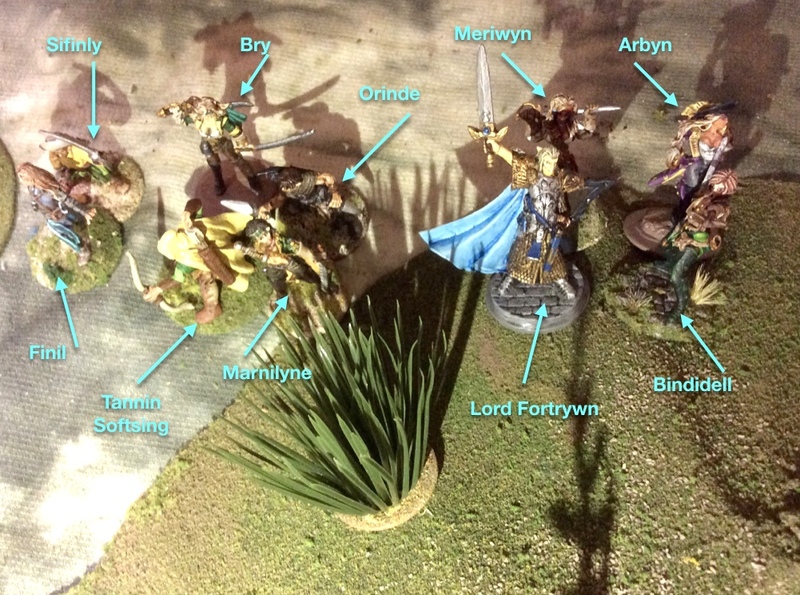 Meanwhile, Lord Fortrywn’s Niece and Warden, Marnilyne, also advanced with her group a short distance away along the valley. The young Elf thought she saw movement further down the valley, where a third ridge split it into a Y shape, and paused a moment to cast her Plant Walk spell. As she chanted, the patch of jungle running down the center of the valley, slowly began to move along the ground, the roots churning the soil as it went, until it had rotated it’s position almost 90 degrees, and was now straddling the valley floor almost completely, mostly sealing it off from anyone down at the far end. Up on the hill to her left, her Uncle and his companions had reached the small head-shaped totem and studied it. It was covered in strange runes, the likes of which none had ever seen; and at its base, a few inches in front of it, there was a flattened, domed-topped, stone the size of a small shield with more carvings upon it. Meriwyn extended her hand and towards the totem, and could feel a strange heat radiating from it. A sense of dread came over her. Lord Fortrywn also could feel his Blood Burn prickling under his skin even though he was doing nothing but standing there gazing at the statue. "Do you think that domed rock is covering something?” Arbyn ventured. The tall Crew-woman, took one look back at Meriwyn and saw she was slowly recovering herself; then turned and faced the stone with her jaw set. Already she could feel the dread building as she approached, but fought it; and kneeling down, gripped the stone firmly with both hands near where Meri had. Almost immediately the doom descended upon her, and closing her eyes she tried to fight it as she heaved at the rock. Pulling with all her might, as she stared at a bloody death behind her shut eyes, she found the panic welling up inside and tried to concentrate on the ache in her arms and fingers rather than the images she saw. The rock budged a little and she could feel a tingle of hope in her fingers. It was what she need at that moment and she latched onto it. Fighting the Darkness, before all her mental and physical energy were sapped, Arbyn gave a last pull with all she had left, and the stone came free. (Arbyn passes Will roll to free treasure.) The Crew-woman fell back with the release of the stone, and like her companion, sat there on the ground for a time simply trying to regain herself. Bindidell took the initiative, and moved forward to peer into a hole that had appeared beneath the rock. There inside was a small chest, and the Hunter reached down and grabbed it. 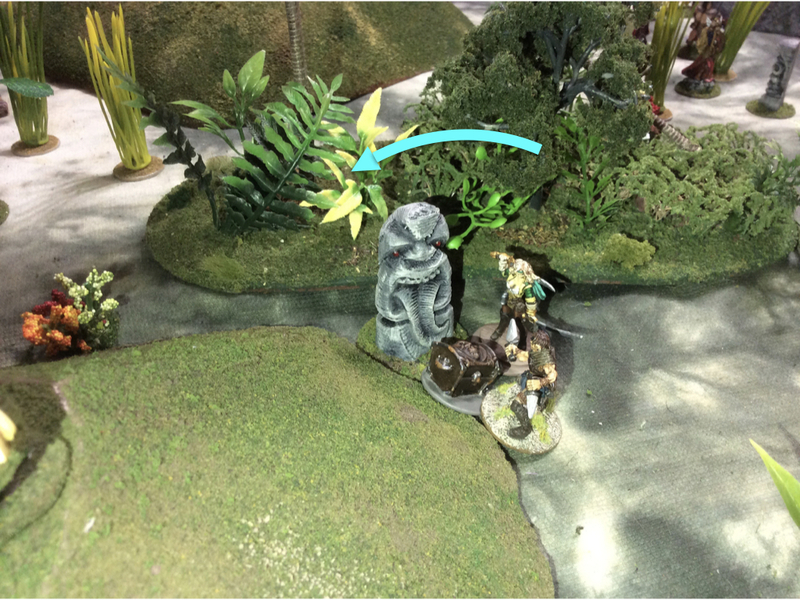 Marny rotates the patch of jungle, and Orinde and Bry move forward and recover the treasure from the totem. Back in the valley, Marny worried about the gentle slope at the end of the ridge on the right, next to the jungle she had just moved, and decided to cast some Brambles upon it to aid in the deterrent of any trespassers on their activities. As she did this, Tannin took up a firing position nearby, behind some tall grasses and readied his bow. The two crew members, Bry and Orinde, ran up to the totem on the valley floor. Their experience was similar to that of their friends on the hill; a sense of dread simply being in the vicinity of the thing. And, as Bry tried to dislodge the domed foot stone, she too was overcome with horrible visions and feelings of doom. Like her sister-crewmember, Arbyn had done, Bry was able to push through the panic and freed the stone. Reaching into the hole beneath, Orinde, likewise, recovered a small chest. Meanwhile, Sifinly and Finil had climbed the long slope of the ridge on the right to check out the totem there. As they reached it, they saw that they had been beaten to the prize; two strange Duckmen had already recovered the hidden treasure and were about to make their getaway down a vine ladder on the cliff behind them at the ridge’s edge. Quickly the two Elves charged at the Duckmen with the treasure. Finil sliced wildly with his sword, and missed; but Sifinly’s sword connected and feathers flew as he put a deep gash in the creature. Quickly, the Crewman tired to bring his blade around again with a backswing, but the Duck had his sword ready, and cut under the Elf, his blade sinking deep into Sifinly’s leg. The Elf Crewman’s leg collapsed, and he pitched backwards, rolling back down the slope where he lay, unmoving. (The duck Crewman rolled a 20!) Finil took the brief moment of the Duckman’s sword being in his friend’s leg, to strike at the creature himself, hacking the enemy Crewman again, and sending him tumbling backwards off the cliff, as the treasure chest he was holding fell from his hands. It fell right at the feet of the other Duckman, who scooped it up, and in a flash jumped over the cliff with it. Finil thought to follow, but when he looked over the cliff, he could see there were more of the fowl creatures in the far valley, so decided to withdraw instead. 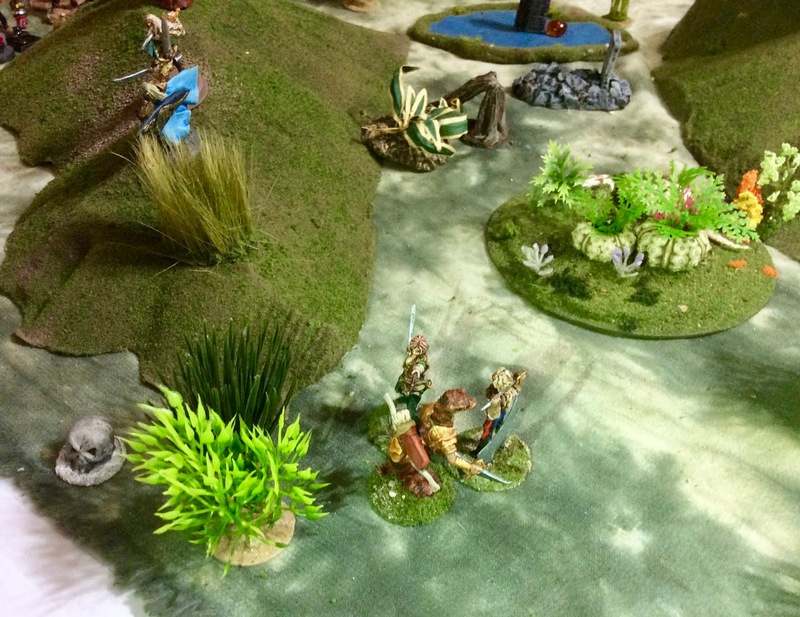 Sifinly and Finil battle the Duckmen for a treasure. Back on the other ridge, Bindidell, clutching the treasure, ran back down the slope towards their rendezvous point. With a sigh, Lord Fortrywn said to Arbyn, “Get her back. You take it. I need her bow.” In a flash, Arbyn was running down the hill after the Hunter and shouted “Bindi! Wait!” Bindidell stopped as if she had hit a wall, she rounded on the Crew-woman and, dropping the treasure on the ground, shouted back, “Never! Never, call me ‘Bindi!’ I hate it! It’s a dancing girl’s name! I’m no tavern harlot! And I won’t be called as one." Fire burned in her fair cheeks as she started back up the hill fuming. Arbyn halted, puzzled, and approached the Hunter cautiously. The hunter merely pushed passed her under a personal dark cloud, both angry at the perceived insult, and embarrassed about the outburst. Arbyn stood a moment still puzzling and watched the other Elf head back up the hill. She then bent down and picked up the treasure, and turned for the rendezvous point. Back on the hill, Sir Fortrywn had heard all the shouting and had headed a short way down the slope to see what was wrong. By the time he got near, it was all over, and he only saw the Hunter striding up towards him and Arbyn picking up the treasure. "What was that?” he asked Bindidell as she approached. 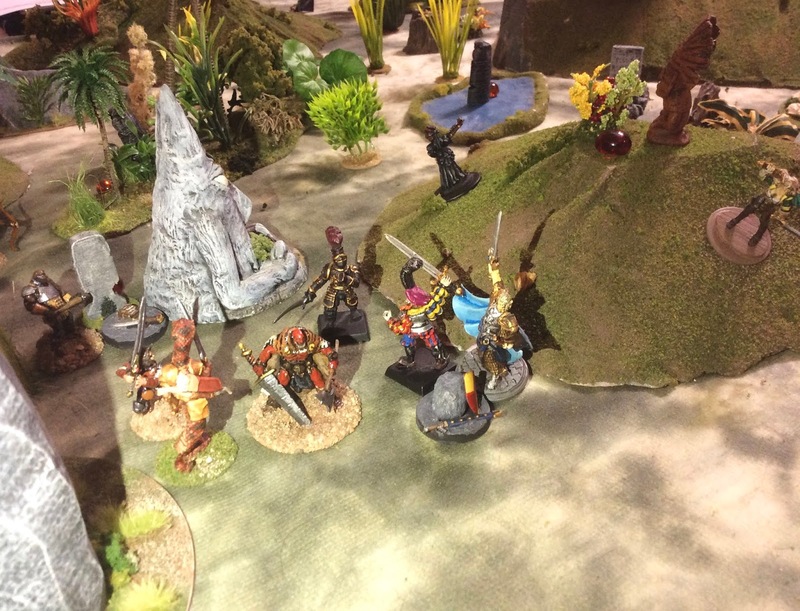 Meanwhile, seeing the Orinde safely had the other treasure and was well on his way to the rendezvous point, Tannin and Bry climbed the ridge to find Sir Fortrywn. Marny went to make sure all was well with Finil and Sifinly. Back on the other side of the jungle there on the ridgetop, Lord Fortrywn, Meriwyn, and Bindidell met up with Bry, and formulated a plan. The Elf Heritor at this point had also spotted Skorri and his Crewman fleeing with the treasure from the monkey totem, and decided things were going so well, now wasn’t the time to tangle with that foe. As he scanned the surrounding area, he caught sight of another group of crewmen milling about in a valley just a ridge line away. If his keen eyes weren’t mistaken, it was some of the Heritor Gregorious’ men; and they appeared to be dragging some chests with them. That looked like a good target. As the four of them set of down the slope into the near valley, they sensed some movement in the tall grass off to their left, and a Tribal Hunter jogged into view. Bindidell quickly ran down the slope to get a better shot, and let loose an arrow. It hit the Tribal in the side and spun him around. (-8 HP) Quickly the Tribal raised his own bow, but before he had time to notch an arrow, Lord Fortrywn was down the hill by his Hunter in a few long strides, with his own bow readied; and let fly an arrow of his own. It hit the Tribal squarely and dropped him on the valley floor. Marny is abushed by another Tribal Warrior. 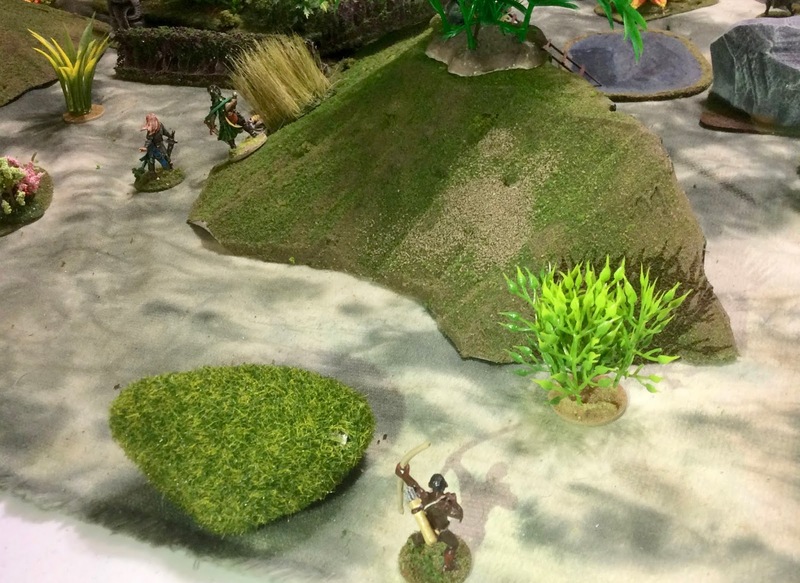 Back at the far valley; Lord Fortrywn, the Crew-women Meriwyn and Bry, and Bindidell the Hunter were making their way to the next ridge, when there was another disturbance in the tall grass and a Snakeman appeared, apparently in pursuit of the Tribal Hunter. He was shocked to see the four Elves, and hesitated. Bindidell, called out, "I’ve got this!”, as she turned and headed for the new threat, and Meriwyn headed after her to help. Confident the Snakeman would be handled by the Hunter and Crew-woman, Lord Fortrywn and Bry continued on over the next ridge. 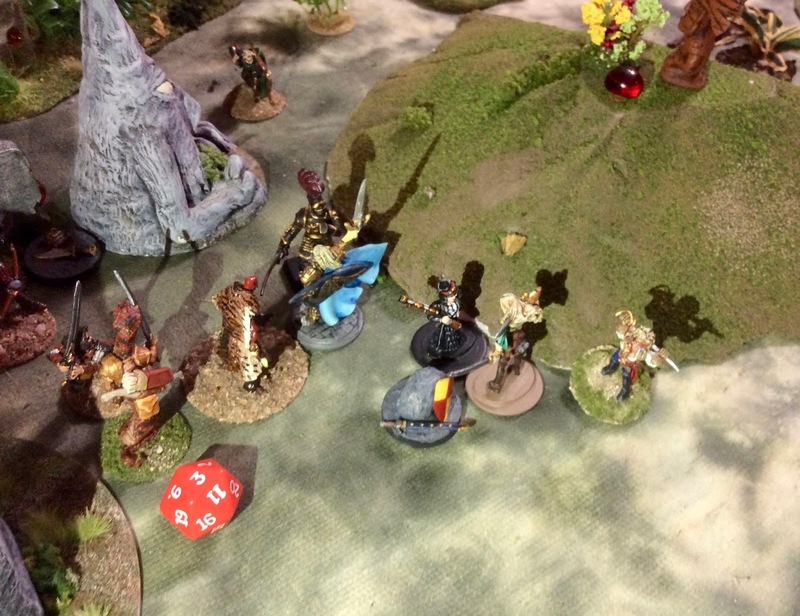 As the pair of Elf-women charged the Snakeman, the creature drew his sword, and prepared to meet their attack. He was no match for the pair of seasoned Elven fighters though. First Meri sliced low putting a gash in his soft belly scales; and then Bindi hit him high, cutting downward as the creature bent over in pain, almost severing his head from his neck. 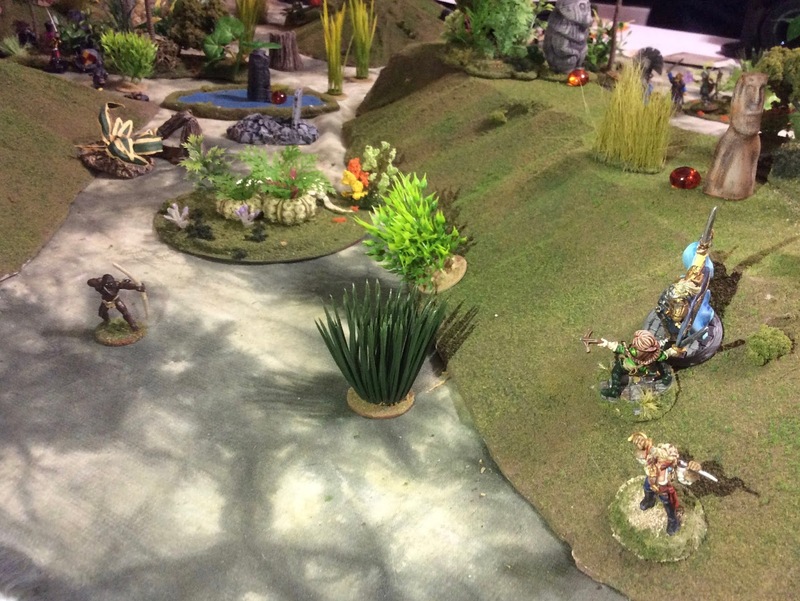 Bindidell and Meriwyn attack the Snakeman, as Lord Fortrywn and Bry continue on and up over the next ridge. 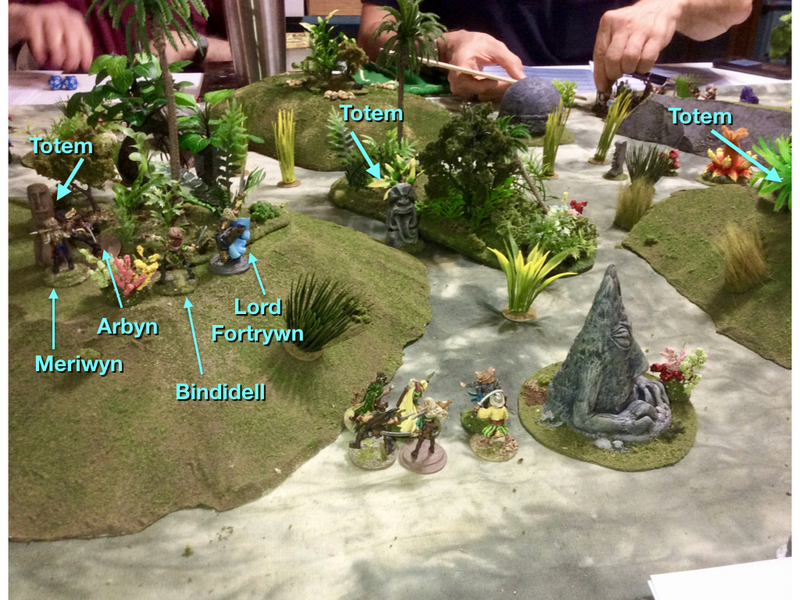 As Meri and Bindidell finished off the Snakeman, Lord Fortrywn and Bry continued up the far ridge and reached the top. Quickly the Heritor surveyed the situation. The pair of Elves were shocked at what they saw. There was not just a few of Gregorious’s crew but most of them. And not only Gregorious’ but half of Kragmar of the True Blood’s as well. What’s more, Gregorious and Kragmar themselves were there engaged in a sword fight. Lord Fortrywn, saw his opportunity. Everyone was busy watching the two Heritors fight, but there was one lone Crewman dragging a treasure at the base of the ridge who no one was watching. Quickly he charged down the slope as he drew his sword, and in a flash had killed the poor Crewman with a single blow. Bry was right behind him and scooped up the treasure. Everyone had noticed the commotion though, and now many eyes turned to look at the pair of Elves who just appeared. Lord Fortrywn made a snap decision, and launched himself at the two Heritors standing there in order to buy Bry some time. The three, formed a triangle each eyeing the other. As the trio of Heritors faced off, Kragmar’s Storm Warden, Samael Gale, was not idle. There was sudden gust of wind, and Gregorious’s Warden, Missy, found herself blown directly from where she stood into Bry. (Samael Gale casts Wind Blast.) Missy recovered from the shock first, and drew her sword, but she was right on top of the Elf and there was no room to swing, so pulling her arm back she thwacked the Elf on the side of the head with her fist wrapped firmly around the sword’s grip. The Warden’s powerful blow dropped the Elf like a stone. Lord Fortrywn charges and dispatches one of Gregorious’ Crewmen. Kragmar bristled. He was now the odd man out. He wanted to fight, knowing how bad off Gregorious was, and positive the Elf was no match for his skills; but with the two of them in agreement, that put the odds against him. So, he grunted his agreement, and sheathed his sword; swearing silently to himself that he wound find these two cowards again. Cautiously, the three backed off. Lord Fortrywn gathered the unconscious Bry in his arms and departed quickly before anyone could change their mind. Bry picks up the treasure as Missy is blown into her. Meanwhile Lord Fortrywn faces off against two other Heritors. Later that evening, aboard the Silver Sword, spirits were high. No one had been lost or badly injured on this expedition, and two treasures had been recovered. Lord Fortrywn sat in his cabin, the day’s spoils laid out on his desk in front of him; 70 gold coins, and a wax sealed vial that his Niece, who was in her own cabin recovering from the poison, had identified as a Potion of Free Fall. He had played things cautious on the island, and it had paid off; but there was still room for improvement. Perhaps his luck was turning. It was time to rest, and start preparing for the next time. In the distance he could hear the crew singing a song of the seas. He smiled, and turned to retire for the evening. The aftermath: Two treasures recovered, and two crewfolk fallen, though both made a full recovery. It was great to finally break the cycle of everybody getting “killed” and recovering only one treasure! I looked back, and this is the first game of the campaign in which I managed to get more than one treasure. Finally! It was a tactically interesting game as well. The hills running across the table added an interesting element, and managed to channel the crews a bit and provide some level of separation. Interestingly, this had to be the most Creature-heavy game we’ve played. Not only did 90%-95% of the treasure rolls bring on creatures, but the scenario called for a roll each time someone was killed, and those too had a high result rate. I was lucky with only having to face three. Some folks, like Herndon, got hammered with creatures entering in their area. Griffin and Robin Duck also faced more than their share of wandering baddies. The Heritor stand off at the end would have been interesting to resolve, but unfortunately the game ended almost immediately afterwards, when Skorri and the last of his crew left the table. I don’t know if I’m sad I didn’t get to see the fight, or happy that Lord Fortrywn was saved from a thrashing. Either way, the treasure Bry was carrying that was dropped when she was knocked out, was not picked up by anyone before the game ended; so remained unclaimed. A small amount of satisfaction there, as denying it to Gregorious was a small payback for his denying me the Dricheans’ Prisoner in game 3.